“You must be kidding!” would be the expected reaction to “Monads in C++.” Hence my surprise when I was invited to Boostcon 11 to give a three-hour presentation on said topic, a presentation which was met with totally unexpected level of interest. I imagine there was a small uptick in the sales of Haskell books afterwards. Before I answer the question: “Why are monads relevant in C++?”, let me first answer the question: “Why is Haskell relevant in C++?” It turns out that Haskell makes C++ template metaprogramming if not easy then at least approachable (see my blog, What Does Haskell Have to Do with C++?). You have to understand that compile-time C++ is a strict functional language operating (mostly) on types. If that is not immediately obvious, it’s because the C++ template syntax is so appalling. Now, not everybody falls in love with the Haskell syntax (at least not at first sight) but it fits the functional paradigm much better than anything else. What’s more, the correspondence between Haskell code and C++ template code is so direct that it could almost be translated mechanically. It really pays to design and test your template metaprograms in Haskell first, before translating them to C++. Conversely, translating complex template code to Haskell may help you understand it better and enable you to maintain and extend it. Those were my reasons to advocate the use of Haskell as a pseudo-language for C++ template metaprogramming. Armed with Haskell I could study and analyze some of the most sophisticated C++ metacode. But when I looked at Eric Niebler’s Boost Proto library and couldn’t make heads or tails of it, even after discussing it with him over email and over beers, I was stumped. Great things come out of abusing C++. One example is the abuse of templates (which were originally designed to support parametrized data types) to express compile-time computations. The result is Template Metaprogrammming (TMP). Another example is the abuse of operator overloading, which created a fertile ground for Embedded Domain-Specific Languages (EDSLs). Eric’s Proto combined the two abominations into a library for constructing EDSLs. You execute that object (because it is a function object) with appropriate arguments, and get the results you wanted. A more general EDSL will also create a runtime data structure that stores the values of any variables and literals in the expression. Algorithms can walk the tree at compile time, runtime, or both to compute values and perform actions. You can even write a compile time algorithm to compute a runtime algorithm that munges trees in interesting ways. My moment of Zen was when I realized that an EDSL corresponds to a Haskell reader monad. (If you’re not familiar with Haskell or monads, read my series, Monads for the Curios Programmer.) To my own amazement this analogy worked and led to executable code. It turns out that the most important step in this process is to be able to convert an expression tree into a function object. Let me do this in Haskell first, and then translate it into C++. 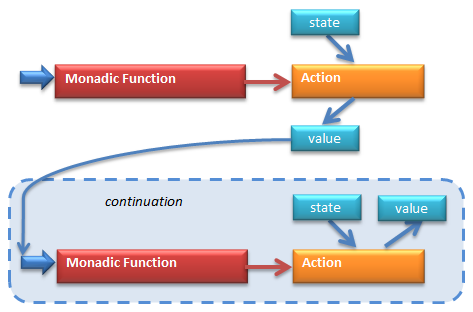 The state, in the case of our expression monad, is a collection of two values — the arguments to the lambda. They will be used to replace the two placeholders in the expression. This is a function that takes a Prog t as its first argument and pattern matches it to the constructor (PR act). The second argument is the state, args of type Args. The result of running the program is a value of type t.
getArg takes an Int (in our case, zero or one) and returns a lambda (encapsulated in a Prog using the constructor PR). This lambda takes a list of Ints, args, and extracts its n’th element (args !! n means: take the n’th element of the list, args). You’ve seen examples of monadic functions in my previous blog post, but it’s worth repeating the idea: getArg is a function that returns an action that is like a promise to extract the n’th argument when the arguments become available. Just for fun, here’s another monadic function that takes n and promises to return twice n when the arguments are provided. It doesn’t matter that the arguments are going to be ignored. In our case, the continuation is a lambda that takes an argument v (that’s the future result of the first action) and performs doubleIt v.
This lambda returns an action because doubleIt v returns an action. You might have noticed that I use the words “action” and “program” interchangeably, although, strictly speaking, an action is the contents of a program. However, this distinction is an artifact or a Haskell quirk — a monad can’t be defined using a type alias, so we need the Prog type to encapsulate the action. Curiously, we won’t have this problem in C++. This is very much like the state monad bind, except that we don’t have to worry about chaining the state, which is immutable. In fact the above is the definition of the reader monad’s bind. It takes an expression tree (the source) and returns a program that evaluates to an integer. Looking from another perspective, compile is just a monadic function in our Prog monad. Remember, return is a function that takes a value and returns an action (program) that will produce this value when executed. The translation of the Haskell expression monad to C++ is almost embarrassingly easy. I’ll be showing Haskell code side by side with its C++ equivalents. In C++, the expression tree is a compile-time construct that is expressed as a type (I’ll show you later where this type originates from). We have separate types for all the leaves, and the non-leaf nodes are parametrized by the types of their children. C++: State is a runtime object. I implemented it using an array of two integers and, for good measure, I added a constructor and an accessor. Here’s the tricky part: How to represent an action? 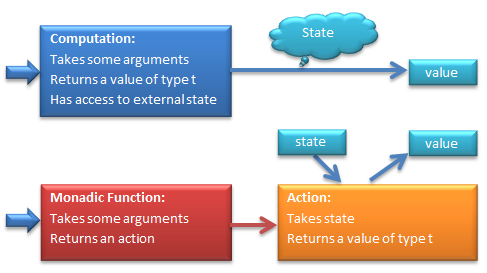 Remember, an action takes state, which is now represented by Args, and returns a value of some type. Because Args are only available at runtime, an action must be a runtime function or, even better, a function object. How does that fit in our compile-time/runtime picture? We want our C++ monadic functions to be “executed” at compile time, but they should produce actions that are executed at runtime. All we can do at compile time is to operate on types, and this is exactly what we’ll do. We will create a new type that is a function object. A function object is a struct that implements an overloading of a function-call operator. There’s another way of looking at it by extending the notion of a metafunction. In one of my previous posts I described metafunctions that “return” values, types, or even other metafunctions. Here we have a metafunction that returns a (runtime) function. This view fits better the Haskell monadic picture where a monadic function returns an action. which, for many reasons, is useless. What we really need is for PR to be a “concept” that specifies a type with an associated method, operator(), of a particular signature. Since concepts are not part of C++11, we’ll have to rely on programming discipline and hope that, if we make a mistake, the compiler error messages will not be totally horrible. It is a metafunction that takes a compile-time argument n and “returns” an action. Translation: it defines a struct with an overloaded operator() that takes Args and returns an int. Again, ideally this metafunction should be a struct that is constrained by the concept PR. It takes two arguments: an action and a continuation. 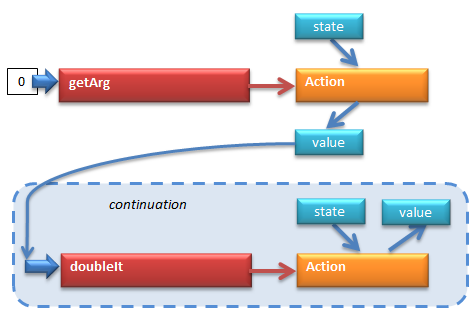 We know what an action is in our C++ construction: it’s a function object with a particular signature. We’ll parameterize our C++ Bind with the type, P1, of that object. The continuation is supposed to take whatever that action returns and return a new action. The type of that new action, P2, will be the second template parameter of Bind. Notice that at runtime we will want to construct an object of this type, Bind, and pass it the runtime arguments: the action and the continuation. The role of the constructor requires some explanation. Haskell function bind is a monadic function of two arguments. Its C++ counterpart is a metafunction that takes four arguments: P1 and P2 at compile time, and prog and cont at runtime. This is a general pattern: When constructing a monadic metafunction in C++ we try to push as much as possible into compile time, but some of the arguments might not be available until runtime. In that case we shove them into the constructor. Things to observe: A smart compiler should be able to inline all these calls because it knows the types P1 and P2, so it can look up the implementations of their function-call operators. What’s left to the runtime is just the operations on the actual runtime values, like the ones done inside GetArg::operator(). However, I have been informed by Eric Niebler that many of these optimizations are thwarted by the choice of std::function for the representation of the continuation. This problem can be overcome, but at some loss of clarity of code, so I’ll stick to my original implementation (also, see Appendix 2). Of course, in full generality, Return should be parameterized by the return type of its operator(), but for this example a simple int will do. The argument v is only available at runtime, so it is passed to the constructor of Return. It takes an expression tree and returns an action that evaluates this tree. In Haskell, we defined compile using pattern matching. We can do the same in C++. Just like we split the Haskel definition of compile into multiple sub-definitions corresponding to different argument patterns, we’ll split the C++ definition into multiple specializations of the general template, Compile. I could have defined a separate overload of operator() for this case, but it’s simpler to reuse the one in Return. The logic is simple: First we compile the left child and bind the result with the continuation (the lambda) that does the rest. Inside this continuation, we compile the right child and bind the result with the continuation that does the rest. Inside that continuation we add the two results (they are the arguments to the continuation) and encapsulate the sum in an action using return. Notice that the second lambda must explicitly capture the local variable, left. In Haskell, this capture was implicit. The types for the instantiations of the two Bind templates can be easily derived bottom up. Ideally, we would like the compiler to infer them, just like in Haskell, but the C++ compiler is not powerful enough (although, at the cost of muddying the code some more, one can define template functions that return Bind objects of appropriate types — in C++ type inference works for template functions). It’s quite a handful and, frankly speaking, I would have never been able to understand it, much less write it, if it weren’t for Haskell. You can imagine the emotional moment when I finally ran the test and it produced the correct result. I evaluated the simple expression, Arg1*Arg2+13, with arguments 3 and 4 and got back 25. The monad worked! These little objects can infect any expression with their Lambda-ness, and spread the infection with the help of appropriately overloaded arithmetic operators. All this is just type analysis done by the compiler to find out what type of object is returned by the outermost call to operator+. This function will be called at runtime with the arguments 3 and 4 to produce the expected result, 19. The code that has to be actually executed at runtime is the call to prog(args), which is mostly a series of Binds, an addition, and a multiplication. Since the implementation of a Bind‘s function-call operators has no flow of control statements (if statements or loops), it can all be inlined by an optimizing compiler (modulo the glitch with std::function I mentioned earlier). So all that’s left is the addition and multiplication. Eric tells me that this is how Proto expressions work, and there is no reason why the monadic version wouldn’t lead to the same kind of performance. I came up with this C++ monadic construction to help me understand the kind of heavy-duty template metaprogramming that goes on in Proto. Whether I have succeeded is a matter of opinion. I exchanged some of the complexity of template manipulations for a different complexity of Haskell and monads. I would argue that any C++ template metaprogrammer should know at least one functional language, so learning Haskell is a good investment. Monads are just part of the same Haskell package. Assuming you understand monads, is the monadic construction of an EDSL simpler than the original using Proto? I will argue that it is. The implementation of Proto is pretty much monolithic, the concepts it’s using have very little application or meaning outside of Proto. The monadic approach, on the other hand, decomposes into several layers of abstraction. At the bottom you have the construction of the state-, or reader-, monad. The monad exposes just three primitives: the type constructor, bind, and return. With these primitives you can create and compose monadic (meta-) functions — in my example it was the compile metafunction. Finally, you use these metafunctions to build an EDSL. With this three-layer structure comes a well defined set of customization points. Users may plug in their own type constructors and implement their own Bind and Return. Or, they might use the default monad and just create their own monadic functions. It’s important that the procedure for building and composing monadic functions is well defined and that it uses straight C++ for implementing the logic. Inside a monadic function you can use regular C++ statements and standard control flow devices. It’s not yet totally clear how general this approach is — after all what I described is a toy example. But there is a lot of interest in re-thinking or maybe even re-implementing Boost Proto and Phoenix in terms of monads. At Boostcon I started working with Joel Falcou and Hartmut Kaiser on this project, and later Eric Niebler and Thomas Heller joined our group. We believe that having solid theoretical foundations might encourage wider acceptance of some of the more complex template libraries. Especially if strict one-to-one correspondence with Haskell code could be established. I’ve been given so much feedback on my Boostcon presentation and the drafts of this blog post that I should really list the following people as co-authors: Eric Niebler, Thomas Heller, Joel Falcou, and Hartmut Keiser. Thank you guys! This page has been translated into Spanish language by Maria Ramos. The picture wouldn’t be complete if I didn’t provide the translation of the EDSL construction back to Haskell. It’s pretty straightforward, except for the last part where an expression becomes a callable function object. Maybe there is a way to bend Haskell’s syntax to do it directly but, since this is just a proof of concept, I took a shortcut and defined a function toFun which turns a Lambda expression into a function. The overloading of arithmetic operators is done by making Lambda an instance of the type class Num. Bartosz Milewski, What Does Haskell Have to Do with C++? You could also try some adventures with template haskell to do compile time edsl – you get to use haskell as the language to manipulate haskell code itself for type-safe compile-time metaprogramming. Starting ghci with the -XTemplateHaskell extension enabled..
— Now enable template haskell..
— Use runQ to get the syntax tree for “let x in 5 in x * x”..
— Now use “$()” to splice that syntax tree into the program and execute it..
You could of course write a program that manipulates the tree before splicing it in. And functionality is available to manipulate types, look things up in the symbol table, etc. Template Haskell is on my list of things to learn. But we do need C++ for performance, and that’s the real motivator behind this blog post. Best goddamn post I have *ever* read on monads! Amazing read Bartosz, this series of articles about monads convinced me to learn Haskell a few weeks ago and even watch functional programming classes on youtube! But this one article is the one that made it all worth it. It helped me fill so many gaps between Haskell and system languages I’m more used to like C++ and D.
Speaking of which, have you considered monads in D? I’m curious on what your take would be considering D’s features over C++. It should be possible to make D interpret C++ (or any other language) at compile time to generage the appropriate D code that is then compiled by dmd to produce optimized machine code. That’s bindings made easy right there. As for the D language, the real question is: Does D need monads the same way C++ does? Probably not. In D you can execute imperative code at compile time (with some restrictions). There are also mixins for compile-time code generation from strings, which are used to implement EDSLs. As for the question: Is it possible? I’m sure it is, and it’s probably easier than in C++. Never mind, I was just being slow. I’ve sorted it out now. damn wordpress for missing out bits of the code I pasted! Anyway, nevertheless, congratulate you, that’s some pretty impressive stuff right there. @Lee Wei: I edited your comment, inserting back the missing angle brackets that were consumed by the wordpress editor. I also fixed the syntax of Const — good catch! @Lee: The double angle bracket is no longer a problem in C++11. I did compile all examples in Visual Studion 2010.
nice article, I followed your series and tried to implement all of them in C#. @horia: Interesting. C# through linq has built-in monads, so it was a good fit (you used the monadic SelectMany). Of course, in C++, my goal was to increase performance. I’m not sure how it works in .NET. The analog of compile-time might be JIT-time. There is a way of doing that without having to use std::function. Bartosz this series is so incredible! I finally understand monads and learned some expression template techniques on top of that. Really, really great. I clicked the link for your Boostcon videos but it seems to be dead. Any chance you can provide a new link? Thanks for your post. Maybe I’m a bit late to the party, but I was wondering if you’ve any tips on how to detect common sub-expressions. This will evaluate “a” twice, despite the fact that “b” and “c” are called with the same arguments. It would be nice if we could somehow tie multiple outputs depending on common expressions and evaluate those expressions only once. I suppose a simple approach would be to overload = and memoize the result, but then there’s no clear time for when to remove these elements from memory. It seems simpler and and works fine at least with this simple example. Can you please explain why we need ReaderMonad and bind? @Bartosz Milewski Thank you for the answer. I still have a question about reader monad. Since the state in a reader monad is immutable, does it mean “the flow of control doesn’t depend on the result of the first computation” is always true? Can you please show me a C++ DSL example where a reader monad leads to more nature program structure than an applicative functor? It binds the result of the compilation of e1 to a lambda that checks the value passed to it and decides which expression to compile and return. I tried to translate your IF example into c++ and run into a problem: what type should I return from the two branches? I could get it around by using std::function<int(Args)> but I guess it is not the right approach. I know both Compile and Compile will be “executed” at compile time now. However, since the branching relies on runtime value, I think a monad based solution cannot avoid it either.